The Human Movement and Nutrition Sciences (HMNS) Personal Training Service has run for the past 6 years and is highly popular among members of the UQ community. 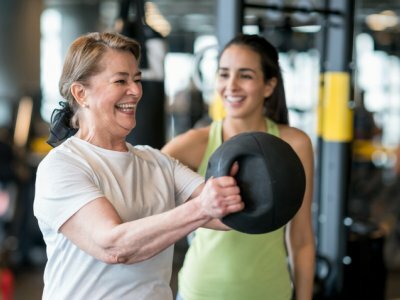 The aim of the service is to assist individuals who are not currently active to become physically active in a way that will enhance their health, fitness and functioning. The service is delivered by postgraduate Clinical Exercise Physoiology students as part of their assessments. Students are closely supervised by an Accredited Exercise Physiologist, creating an environment where they are able to apply the technical skills they have acquired in the first two years of their training while delivering a high quality service. Your involvement as a client will involve 8 personal training sessions over a 4 week period (twice per week). You will also have pre and post-intervention assessments in weeks 1 and 6. After the completion of the pre-intervention assessment, you will receive a personalised 4-week exercise program comprising of gym and at home/ community-based activities based on your physical activity goals. You will be assigned one postgraduate student for the 6 weeks who will lead all personal training sessions and both testing sessions. NOTE: There is unfortunately no flexibility with times. We will be looking for clients who can participate for the full duration of the program. If you are interested in being a client for the program, please let me know ASAP (first in best dressed). If you want any further information about the program, please don't hesitate to ask.